Summary: After moving to a different town in the Northwest Territories to take care of her relatives, Ashley begins having intensely vivid dreams featuring a polar bear. But the strangest part is that the dreams start coming true. With climate change in the works Ashley’s small community is experiencing intense weather like never before, and the changing conditions of the ice have implications for a polar bear’s food supply. Problems arise when the bear comes too close to the community, causing fear and harm to residents. As her connection to the polar bear grows, Ashley learns about the changes happening in the environment and the history of her own family. Her dreams and experiences help her to embrace the special gifts she has, and face the changing future through offering what she has to give. 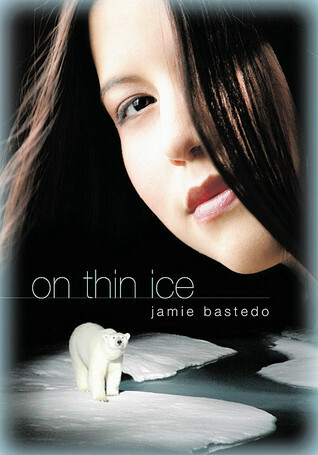 Review: I know technically On Thin Ice by Jamie Bastedo is about climate change. Due to changing weather patterns, the ice up in the Northwest Territories is unknowable and the seals are scarce. The limited food supply and extreme weather conditions drive a polar bear close to a human settlement, endangering the people in it with her pursuit of nutrition. I agree with Bastedo’s logic and how he gently nudges his reader into a greater understanding of what climate change actually means in real life as opposed to just being a catch phrase used by enterprising politicians. But what I enjoyed most about this book was that by the end, I truly wasn’t sure whether the polar bear had come close to the humans because of needing food, or because she had a personal connection with one of them. It was a mystical read, and though it didn’t seem to centre on Inuit beliefs, Bastedo does with his writing what Dr. Lyons does with his research, he works hard to combine Inuit knowledge with scientific knowledge. In the process I grew to love Ashley as a character. She seems to have a destiny to fulfill with gifts passed down to her through her ancestors, and her connect to the polar bear shows up in vivid, future-predicting dreams. Her life is filled with colourful relatives and also an amazing artistic talent. Ashley’s perspective is refreshing and contains wondrous observations of her surroundings. I also enjoyed reading from the polar bear’s perspective, although because I did I had trouble seeing the polar bear as dangerous. I empathized with her need for food and her reactions to the stimulus she was presented with. Logically I know polar bears and humans can’t co-exist in the same location because polar bears are dangerous, but I still had trouble imagining this particular polar bear as anything like the terrifying statue Ashley’s uncle had carved and Ashley had seen in her dream. Quite naive on my part. But at the base of the story is something everyone can relate to: a basic need to learn to adapt to change as it comes. Bastedo explores this theme from different perspectives using his unique characters. Ashley’s mom takes a New Age perspective, her brother remains steadfastly resistant to all change and her aunt seems to absorb anything that comes her way with an air of already knowing what is going to happen. I’m reading Sila’s Revenge, the sequel/stand alone novel by Bastedo the day after tomorrow, and I look forward to reading more of what he has to write about. “I carried my grandfather to a rock that faced the sea. I looked at the sights that drew his eyes. The land, the sky, the sea. I heard a soft melody that grew with strength and pride. From this song, his body moved and our world surged with life. I listened to my grandfather and felt the song deep within my soul. On Thin Ice by Jamie Bastedo is published by Red Deer Press, (2006).